Did a little trade with Matt over at Cardboard Conundrum. Matt, sorry it took me so long to get those cards out to you, but hopefully, they are in your hands right now. Life - yuck. Matt's a hockey collector, so +10 manna in my book right there. Researching his needs, I found a TON of cards he needed. I think it ended up being close to 100. I just recall it was two 55 count plastic cases I sent out. 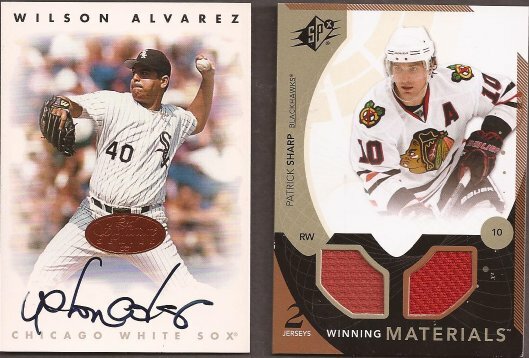 There was one thing on his trade bait that caught my eye - would a crapton of commons be a fair trade for a Blackhawks relic card? To my enjoyment, Matt had no problems accepting the offer, and even asked if there was anything else that caught my eye. The usual "if you have anything White Sox, I'm game" came off my fingers. Matt came through with flying colors if you asked me - a relic and an autograph for all those set completion cards. Matt - you rule! Just what is that Leaf logo covering up, Wilson? A very nice 96 Leaf Wilson Alvarez auto was Matt's choice to include with the 11 SPX dual Patrick Sharp jersey relic. Fantastic additions to my cards. Matt still has quite the needs list, so give his blog a look-see and help him out. What have I learned in 4 trades? Saying "Any White Sox will make me happy" and not being specific seems to get a great response from people. They may think it's nothing much, but to me, I am super joyous. So much so, I have finally created a macro that will save me the time of typing it in my emails. I have preset my computer that when I type in the following command, it will randomize a series of phrases parroting the "any White Sox is fine with me" theme. Here....check it out - it's cool. A screen capture AFTER a disk failure. The internet is amazing!